Do you love science experiments for kids? We totally do and want to help you love them too! Doing simple science experiments at home or in your classroom is the easiest way to teach kids to be problem solvers and critical thinkers and help them develop a curiosity about the world around them. These skills empower kids to be confident in their ability to handle life’s challenges which is a life skill that cannot be overrated! Plus they are a ton of fun to do and a great way to make memories with your family. Ready to get started? 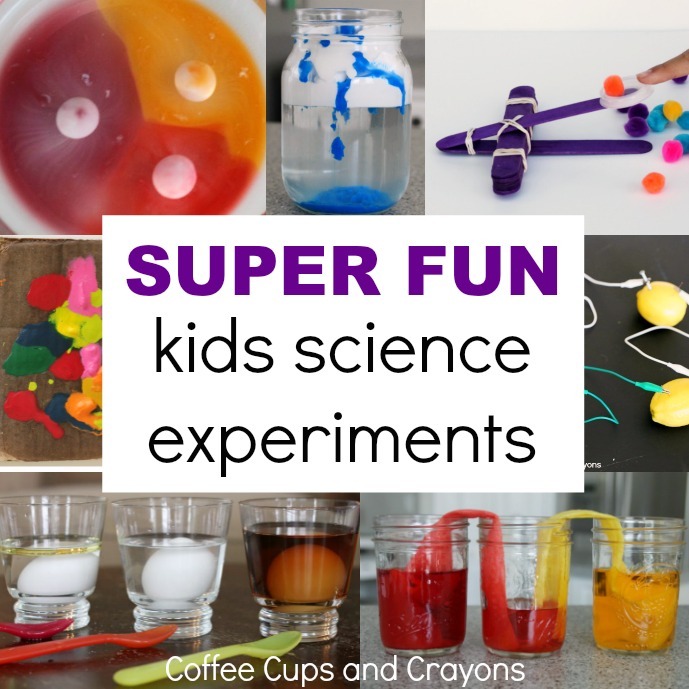 Here are some of our most popular and very favorite science experiments for kids to do! If you are a long time reader of Coffee Cups and Crayons (high five!) then you already know that we strongly believe in simple fun and learning. You probably already have most of the supplies needed for these experiments in your kitchen cupboards right now. 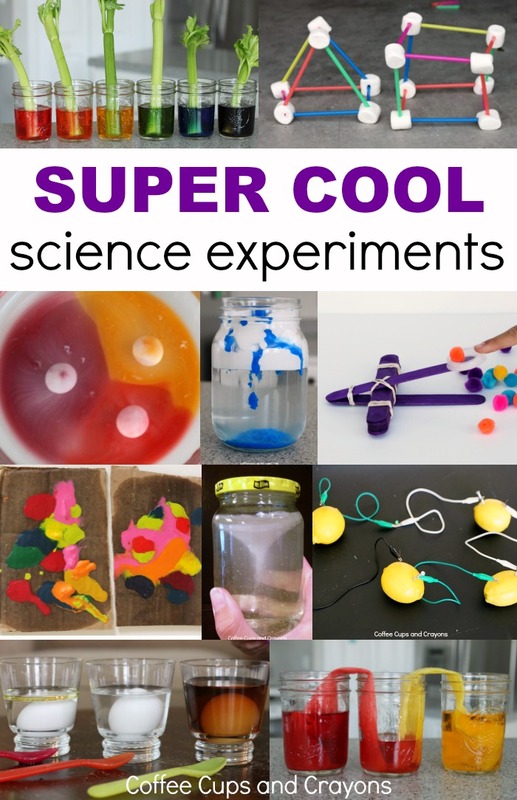 Which is important because it doesn’t matter how cool the science experiment is, if it’s not do-able it will just end up being an image that sits on your Pinterest board forever. Speaking of Pinterest, you’ll want to make sure to pin this page to your favorite board. There’s a ton of experiments on here that you can keep coming back to when you’re looking for a new idea. We’ll also continue to add to this list as we post new ones to make this the best list of science experiments ever! These are the ones you can set up in minutes with items you have in your kitchen. They also make great boredom busters for kids and are perfect for a rainy day! Kids are naturally curious about the world around them. Capitalize on this by doing fun weather and nature themed experiments to help them understand abstract concepts. What can be more fun than experimenting with candy? Not much. Many of the candies (not all) in the experiments below can be swapped for whatever you may have on hand so feel free to do some experimenting of your own! Pop! Fizz! Bubble! Explosions and reactions get kids excited about chemistry and these experiments all pack a big bang. Turn your kids into problem solving engineers with these cool STEM experiments. They can explore how things work and test out some properties of physics while tinkering and experimenting. Get kids in the holiday spirit with science! These experiments make use of the seasonal candy and products and are a great way to add a little learning into the fun of the holidays.